I didn’t get a ton of sleep as my body just couldn’t get comfortable. The camp spot was great, but I was just having a bad night personally no matter how great the sleeping conditions were. I was awake with the sun around 6am and tried to sleep more, but I knew that rain was expected towards the end of the day today, and an earlier start would give me more hours and options before the rain came. I set off at 7:30am. Today ended up being one of my all time favorite days of hiking! I knew to expect some great stuff, but I didn’t expect it to be as wonderful as it was. 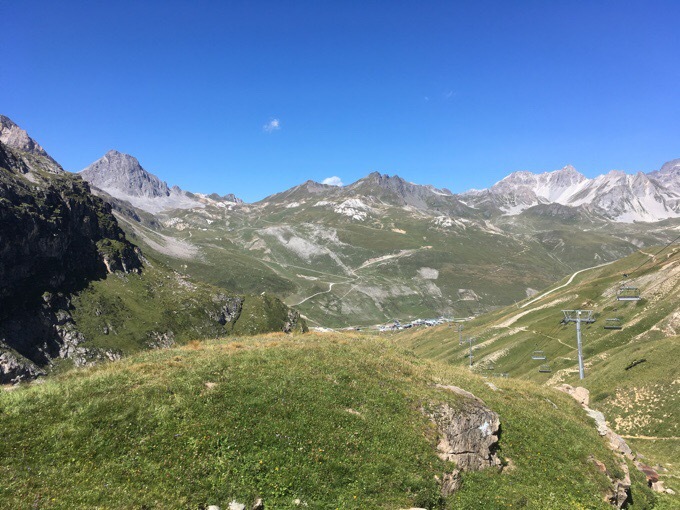 I had a couple hours of hiking before dropping down to a touristy ski resort area for resupply. Like most of the day, it was relaxed hiking with awesome views all around. Very early on, I crested a hill to a ton of cows being herded towards me. I’ve gotten used to them and none have felt threatening out here…until today. 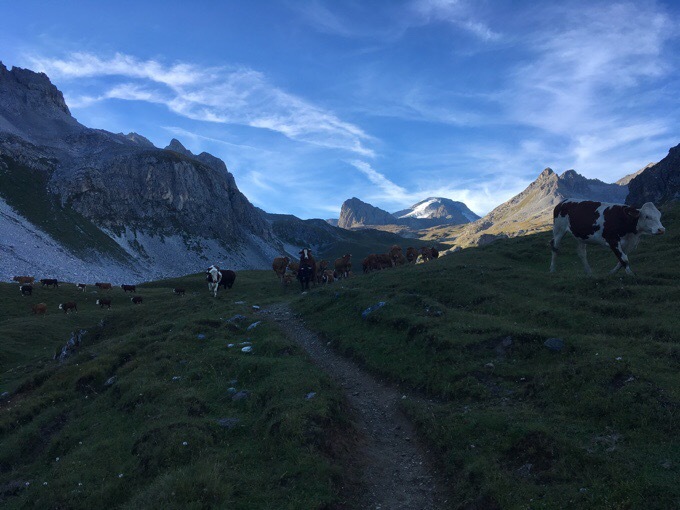 I tend to walk around the herd, and was doing that when another hiker came towards me and stopped me to ask a question. After we split, I noticed the cows were closer than I’d prefer. As I walked away, two cows in particular were kinda yelling at me. One bull that wasn’t too big, but had horns was quite angry it seemed and yelling. He charged at me! TWICE!! Seriously frightening! I yelled and waved my arms and it startled him enough to stop him from charging, but he was now 10m away and still yelling angrily and coming at me. I yelled more and instinctually put my pack towards him to take the horns if he really did get me. Finally the herder in the distance did a call and the bull started to walk away reluctantly. Yeah, that adrenaline took awhile to leave my body. 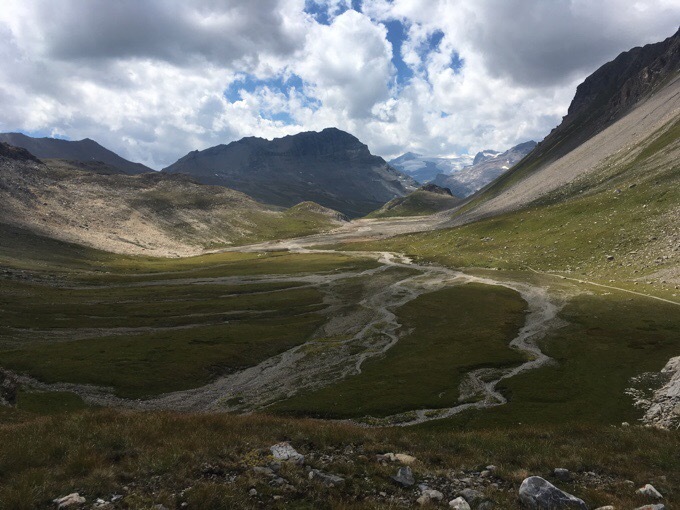 I had the subtle Col du Palet to go over and then the drop down to the high rise resort area of Val Claret. 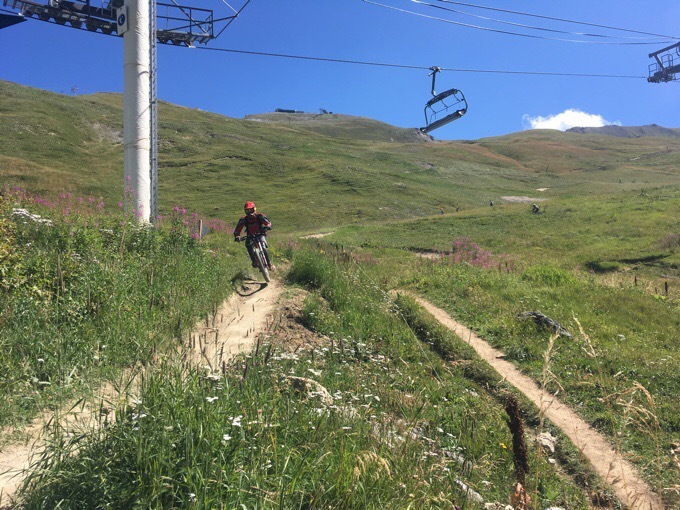 There’s also the option of the larger Tignes-le-Lac (by the lake), but it was out of the way of the route and I knew I could get what I needed at Val Claret. 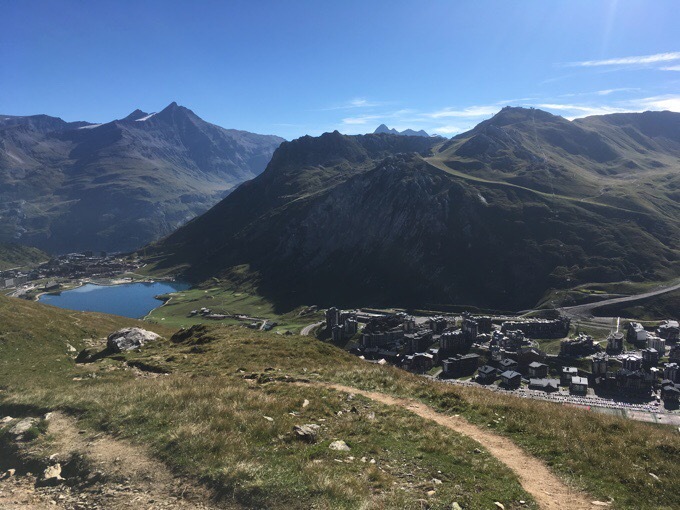 Tignes-le-Lac (left) and high rises of Val Claret. I was surprisingly hungry and had an early lunch. Milk makes my menstrual cramps really bad, so I had a peach iced tea that was perfect, a mini pizza, a chicken wrap, and of course some cups of chocolate mousse I couldn’t resist. I posted the blog, checked the weather, dried out my tent that was a little wet from condensation, and hiked out at about 11:40. The forecast had the rain starting around 5pm and fairly steady overnight. I was glad that it wasn’t going to rain until the evening and I could get a full day of hiking in hopefully without fog dropping down to cover the mountains. 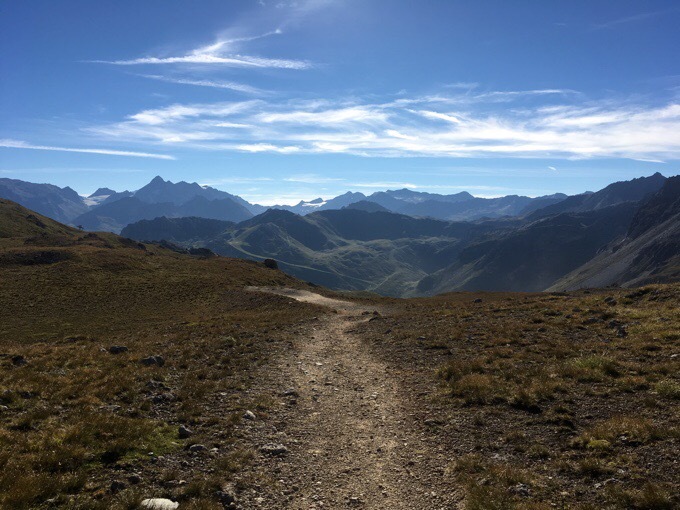 From Val Claret, I was starting a very popular high route option that I’ll be in the next couple of days called the GR55. 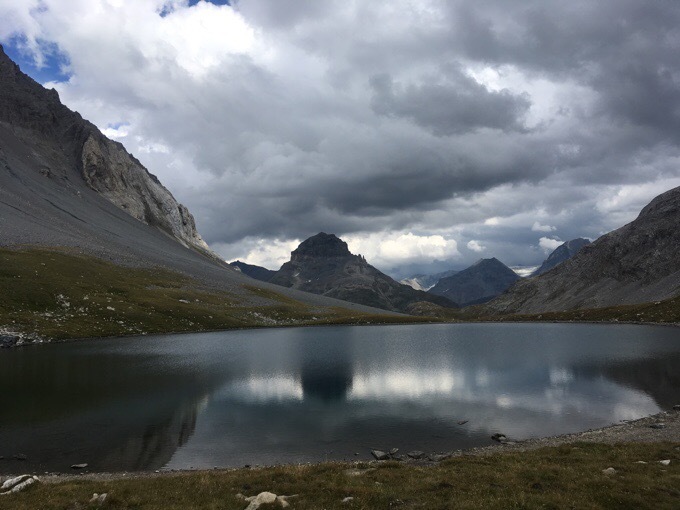 Pretty good timing with the rain as I needed to stay at a refuge within the Vanoise National Park anyway. Some let you tent I think, but the one I was aiming for didn’t. My first refuge! 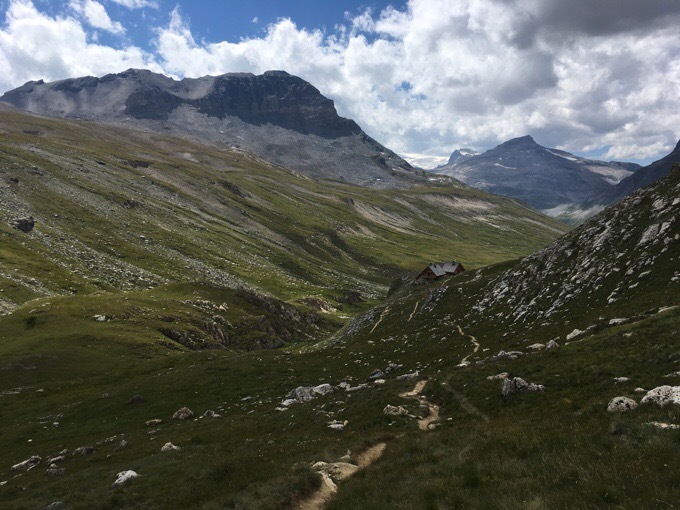 I didn’t even use a refuge in the Pyrenees, so it’s pretty good I’ve avoided it for a month and a half of hiking. The other places I’ve stayed at are gites, which are more like hostels. In those I can be in rooms with fewer people or even on my own. With a refuge, it’s likely I’ll be with many others. The hiking the rest of the day was just awesome! 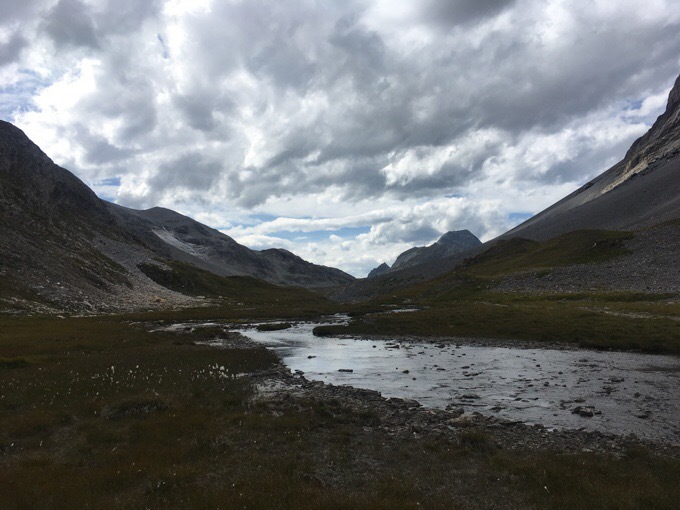 Once I got away from the ski resort area that had hikers, trail runners, and many dirt bike riders, things really quieted down. It felt so relaxing and wide. With my period, my body was drained, so this came at a great time. No exhaustive climbs or descents. Just cruising with wonderful scenery. Looking back after leaving the resort area. I came over from the pass on the left. In the morning, you would have never imagined rain later in the day with how clear and blue the skies were, but as afternoon came, the clouds moved in. I absolutely love the texture clouds add to the scenery, and I took a zillion photos. There was no way to capture the size and openness of all of it. I’m pretty tired tonight, so this will be a photo heavy post. Really, the photos say it all. Just awesome and seriously one of my favorite days of hiking I’ve ever had. 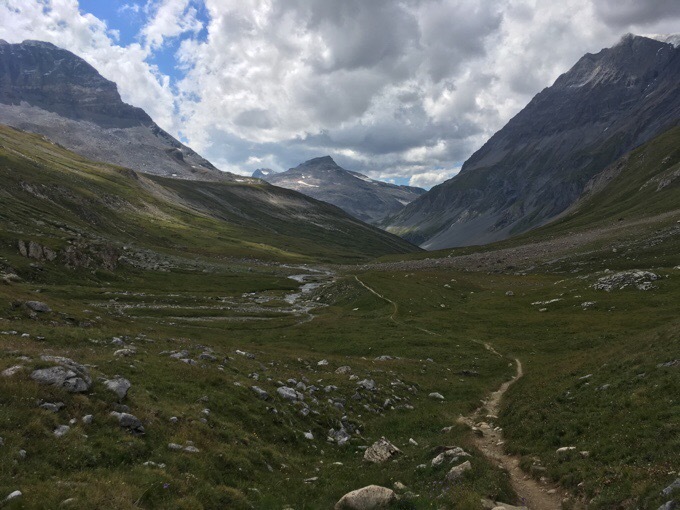 The GR55 and Vanoise National Park should go to the top of the list for those of you looking to do some hiking in the French Alps. I’d even be interested in exploring the park even more after what I saw today. To say that it was one of my all time favorite days when I was feeling like I could have laid in bed all day (thanks to monthly stuff) is saying a lot! Towards the end of the day, there was a climb with switchbacks and a tour group coming down. 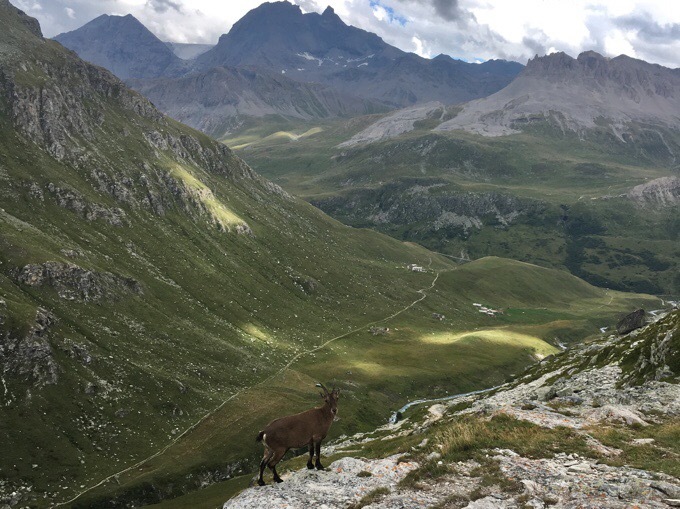 There were a ton of ibex up there and everyone was stopped taking photos and watching them. It was pretty cool. Every switchback I saw a new set. Many families too. None had the huge horns that they can develop, and I’m still hoping to see one of those out here. The ibex posed nicely for me. The final hour or so was just awesome. The sky got darker behind me, but I couldn’t help but stop and take a ton of photos. 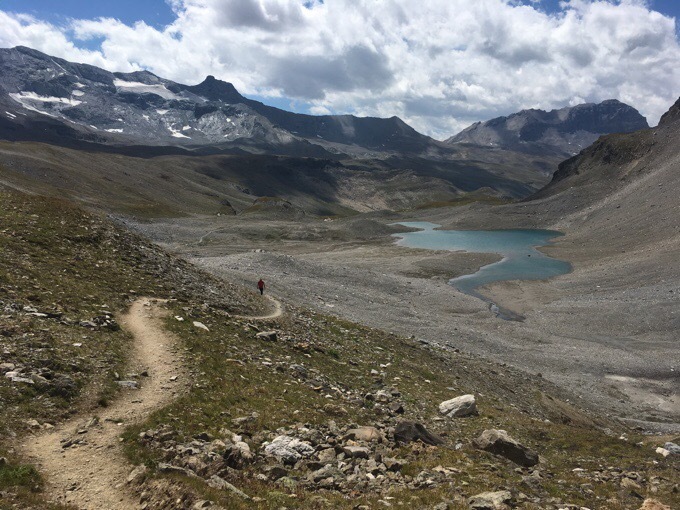 The guidebook described it well saying, “Pass one shallow lake after another with soaring glaciated peaks all around.” Plus, there just weren’t a ton of people around for some reason. Looking back from Lac Rond. What I loved most about today that I hadn’t gotten enough of in the Pyrenees was the relaxing feeling of cruising and just taking in the scenery. That’s tough to find in alpine areas. This was as close as you can get to perfect if you ask me. What a great section. 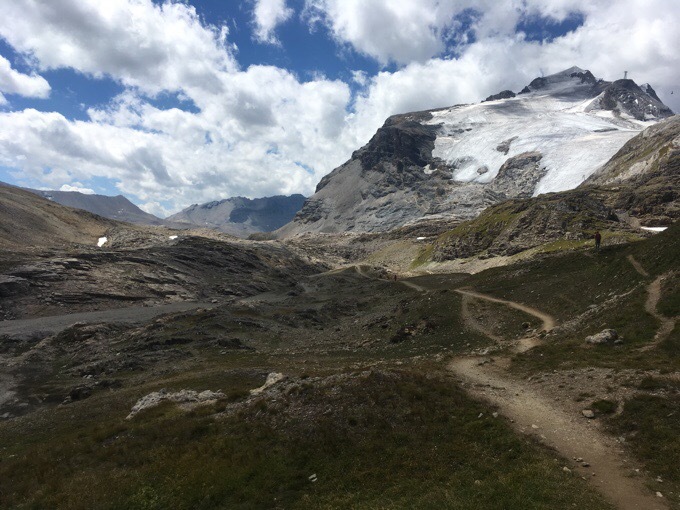 Approaching Refuge du Col de la Vanoise. 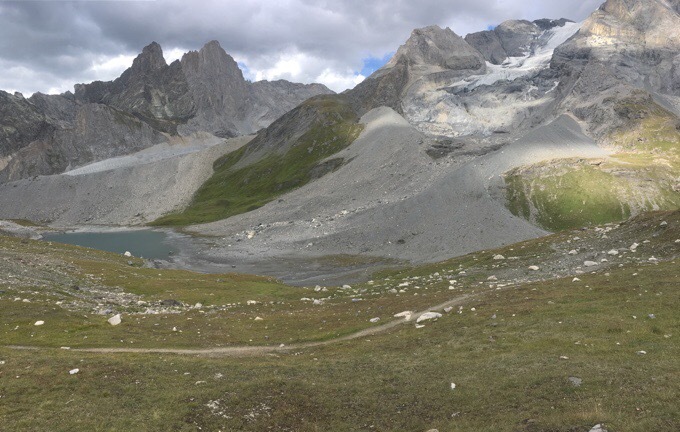 I arrived at Refuge du Col de la Vanoise at 5pm, and for a Saturday night, I was surprised to find that it wasn’t full. I had stopped at a refuge along the way earlier and had them call in a reservation just in case. 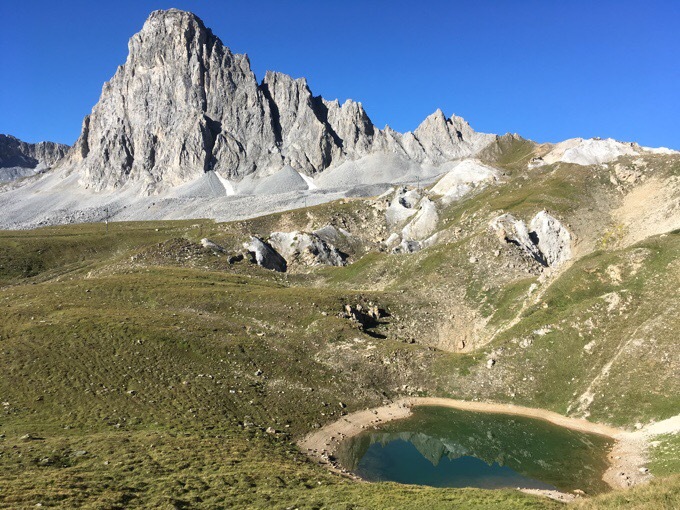 At 8258ft/2517m, this is the highest refuge along the GR5 route. It was €25/$28 for no food and just the bed. I did cave and get a hot chocolate. I was bummed when I was told to wait to pay at the end of the night and found out after the fact that since I used the kitchen stove to heat my own dinner, it was a €2 charge. I totally would have used my own stove. Showers were €2/5min, so I passed on that one. 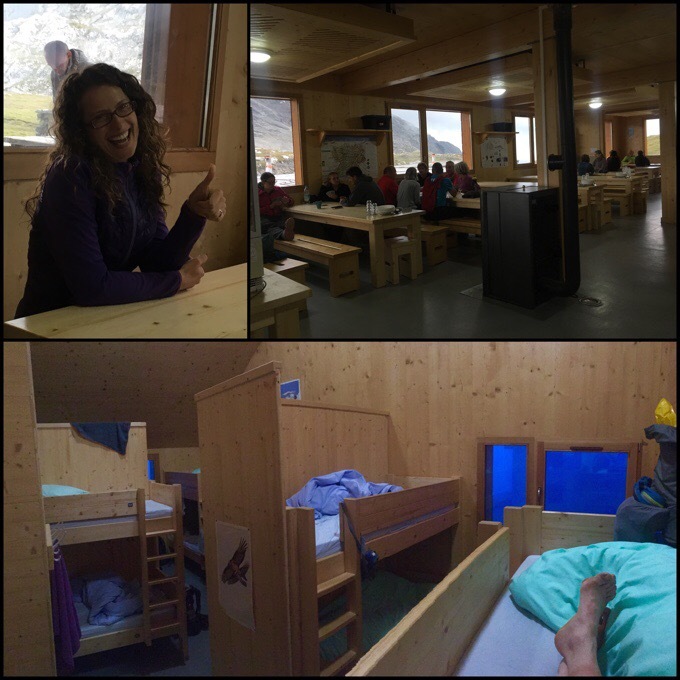 It’s a very new refuge, and the beds are awesome! Bed sheets over the comfy mattress, down comforters, and sturdy wooden bunks that don’t creak when people move. I tried to get a room without snorers. I’m in a room with 11 others and have been told a group of five guys aren’t super loud snorers, but do snore, darn. The other option was a room with one guy that for sure snores loudly. I have my white noise app ready to go. Tough to capture the enormous glaciated peak and lake next to the refuge. I did have some entertainment tonight. A woman from Ireland named Jenny is with a hiking tour group (with the guys that are from Spain) and was stoked to have someone to chat with in English. She lives in Spain, so often doesn’t get to speak English. A woman with an Irish accent is my absolute favorite accent, so I gladly welcomed the chatting. She even commented that she was my television show for the night without knowing my enjoyment of television and that I DO watch a show every night at dinner. She really was my show for the night, haha. Thanks Jenny! Refuge du Col de la Vanoise, and Jenny, my Irish entertainer. The rain started at 6:30pm and now a thick fog has moved in. The forecast had the fog and rain lifting by 8am so I’m hoping for another awesome day tomorrow in the GR55. What a great night to be inside. The timing worked out perfectly. Hey Erin really enjoying the pictures they really are spectacular, don’t know if that the scenery or the great photographer: ?. Are you having issues with connectivity as your post seem pretty consistently. There’s service a ton! Lots even where I tent. Loving that part of this trail as well:) Someone using Orange told me it wasn’t as good for them. I’m using SFR. Interesting. So many pilgrimages out here. Possibilities are endless. I hadn’t even heard of that one yet! Erin, are you using your iphone to capture those pictures? Do you use any special app? These are great photos! It’s the iPhone! Sometimes I’ll use be iPhone photo edit that’s built in. The only other app I use is Snapseed. I think I’m pretty happy with the decision to ditch a camera this year, but where I have issues is when I want to zoom or take photos of animals. Particularly marmots! 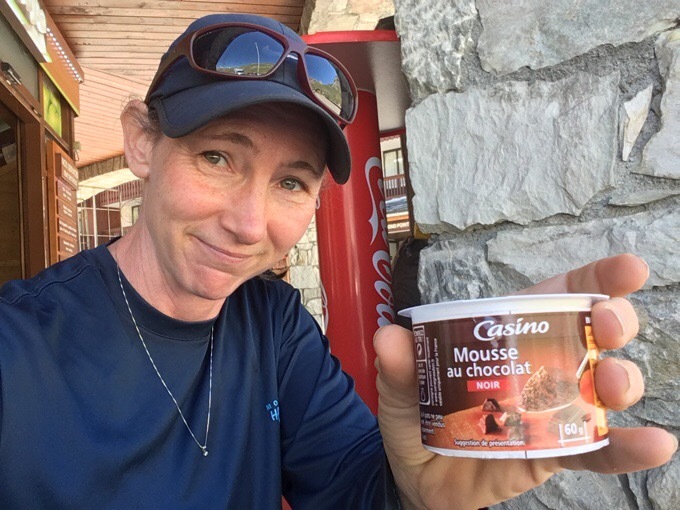 Modane has real suppermarkets. 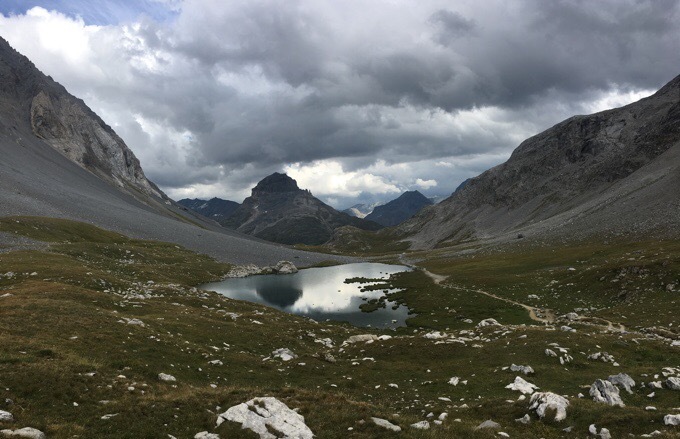 When you get past Gandonecchia, take the GR5c by the Italian border, It is lonely rugged with great views, but there is 15 miles with no water. I was trying to decided on that variant…hadn’t known anyone that took it. I agree! Right on their own neck with every move they make. It’s so loud. Sleeping area looks comfy, but snoring would cause me to have anxiety! “To say that it was one of my all time favorite days when I was feeling like I could have laid in bed all day (thanks to monthly stuff) is saying a lot!” This is truly a blessing. Hope all is really lovely for you. You work hard for it. Hi there! 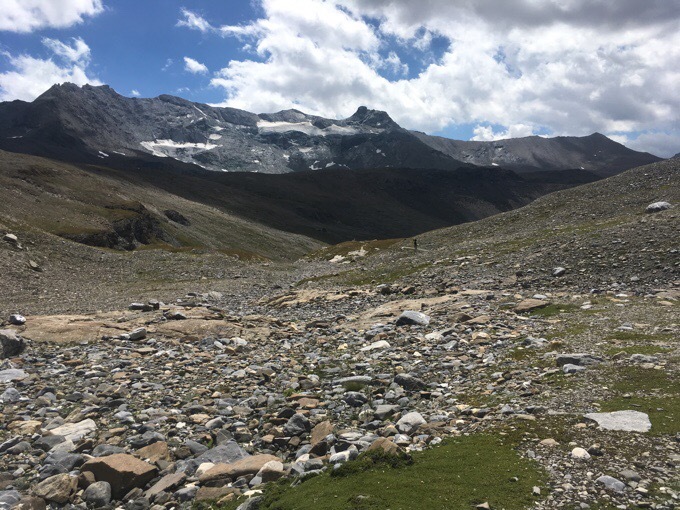 I haven’t been keeping up on your blog all summer because we were on our speaking tour, but I just got all caught up on the GR5 posts and I am hooked. Our US trail list is very long, but if we ever go international again, I think this could be a good choice. Sorry to hear about the increased frequency of your periods! I’ve been having that happen too (every 15-20 days!) and I attribute it to getting older LOL. I think it’s the biological clock yelling at me. Yes, I’m aware you’re there! 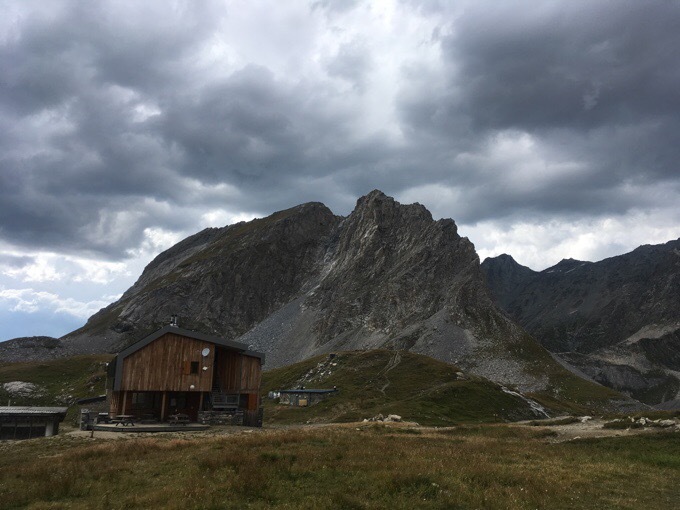 About the nicest refuge we’ve ever stayed in was the CAF Refuge du Fond d’Aussois in the Vanoise. They have nice ones out there!